1K. Roberts (e-mail: kroberts@ciena.com), Q. Zhuge, S. Gareau, and C. Laperle are with Ciena Corporation, Ottawa, Ontario K2H 8E9, Canada. 2I. Monga is with Energy Sciences Network (ESnet), Berkeley, California 94720, USA. In this paper, we discuss building blocks that enable the exploitation of optical capacities beyond 100 Gb/s. 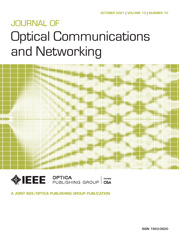 Optical networks will benefit from more flexibility and agility in their network elements, especially from coherent transceivers. To achieve capacities of 400 Gb/s and more, coherent transceivers will operate at higher symbol rates. This will be made possible with higher bandwidth components using new electro-optic technologies implemented with indium phosphide and silicon photonics. Digital signal processing will benefit from new algorithms. Multi-dimensional modulation, of which some formats are already in existence in current flexible coherent transceivers, will provide improved tolerance to noise and fiber nonlinearities. Constellation shaping will further improve these tolerances while allowing a finer granularity in the selection of capacity. Frequency-division multiplexing will also provide improved tolerance to the nonlinear characteristics of fibers. Algorithms with reduced computation complexity will allow the implementation, at speeds, of direct pre-compensation of nonlinear propagation effects. Advancement in forward error correction will shrink the performance gap with Shannon’s limit. At the network control and management level, new tools are being developed to achieve a more efficient utilization of networks. This will also allow for network virtualization, orchestration, and management. Finally, FlexEthernet and FlexOTN will be put in place to allow network operators to optimize capacity in their optical transport networks without manual changes to the client hardware. 27 February 2017: A correction was made to the title.